As already noted above, the earliest known unequivocal fossil primates are of basal Eocene age (about 55 MYA), and the standard view is that primates originated no earlier than about 65 MYA, close to and probably above the K/T-boundary, with their initial radiation following the extinction of the dinosaurs at the end of the Cretaceous. Although the molecular evidence, when calibrated with various fossil dates outside the primate tree, consistently indicates that the lineage leading to living primates diverged from other placental mammal lineages about 90 MY ago (node 1 in Figure 1), it is conceivable that the diagnostic features of known living and fossil primates did not emerge until some time after this divergence (node 2 in Figure 1), and that the last common ancestor of living primates (node 3 in Figure 1) may be even more recent. It might, therefore, be imagined that a species-poor lineage with barely differentiated morphological features did indeed diverge from other placental mammals some 90 MYA, but did not lead to morphologically recognizable primates until 60-65 MYA. This could potentially explain the disparity between the known fossil record and molecular-based estimates of the time of divergence between primates and other mammals. However, available molecular evidence concerning the first divergence among living primates, between strepsirrhines and haplorhines, indicates that it took place relatively soon after the primates diverged from other placental mammals. In what appear to be the only published calibrations of the first divergence among living primates, a date of about 80 MYA is indicated (Arnason et al., 1996, 1998). Hence, if the diagnostic morphological features shared by all living primates and their known fossil relatives can be attributed to common ancestry rather than to convergent evolution (as is generally assumed), these features must have been present at an early stage. If primates diverged from other placental mammals about 90 MYA, the diagnostic features of the group must accordingly have been developed by about 80 MYA, well before the end of the Cretaceous, and a major gap must, therefore, exist preceding the known fossil record. The extent of that gap may in part be due to the K/T mass extinction. A loss of taxa at the K/T boundary and the possibility that some taxa were slow to recover from that event might to some extent explain the difficulty encountered in finding primates of modern aspect in the Paleocene. It should be noted that there is evidence indicating that biological recovery from major extinctions may take as long as 10 MY (Kirchner and Weil, 2000). However, in order to adequately interpret apparent discrepancies between molecular and fossil data it is necessary to develop methods that can quantitatively estimate degrees of incompleteness within the fossil record. A simple calculation by Martin (1993) indicated that only 3% of extinct primate species have so far been documented. Rough correction for underestimation of the time of origin led to the inference that ancestral primates existed about 80 MYA. This preliminary inference has now been confirmed by our newly developed statistical approach (Tavare et al., 2002), which is based on an estimate of species preservation derived from a model of the diversification pattern of the analyzed group. The method takes into account the number of extant species, the mean species lifetime, the ages of the bases of the relevant stratigraphic intervals, the numbers of fossil species found in those intervals, and the relative sizes of the sampling intensities in each interval. It can be used to estimate either: (1) the age of the last common ancestor of living primates or (2) the age of the first morphologically recognizable primate. A logistic diversification model was chosen in which logistic growth is parametrized by the time at which diversity reached 90% of its present value. Various diversification models can be explored with our method, but logistic growth is the most biologically realistic model (Raup et al., 1973), as it matches the general expectation of an equilibrium diversity level. The great diversity of Holarctic primates during the Eocene indicates that at least 90% of modern diversity would already have been reached by the middle Eocene. Consequently logistic growth was parametrized at 49 MYA. We used a mean species lifetime of 2.5 MY, but our results were relatively insensitive to changes in this value. Our approach is based on modeling the speciation process as a nonhomo-geneous Markov branching process with a specified diversification curve. This is a process in which species live for a random amount of time, go extinct and are replaced by a random number of species. The lifetime of the species and the number of descendant species are not affected by any of the other species alive at that time. This is a commonly accepted model for the diversification of a clade (Kubo and Iwasa, 1995; MacArthur and Wilson, 1963; Nee et al., 1994). The branching process allows us to compute the expected number of species alive in a given stratigraphic interval. Assuming that any species alive in such an interval can be fossilized and found with the same probability, we may calculate the expected number of species found as fossils in each strati-graphic interval. Our statistical method is based on matching the observed and expected number of fossil finds in each interval as closely as possible, and a parametric bootstrap approach is used to assess bias in the estimates and to find approximate confidence intervals. Using this approach, we first determined an estimate of the age of the last common ancestor of living primates, (i.e., the time of divergence between strepsirrhines and haplorhines) as 81.5 MYA, with an approximate 95% confidence interval of (72.0, 89.6) MYA (Tavare et al., 2002). This closely agrees with the only available molecular estimates of the strepsirrhine-haplorhine divergence (Arnason et al., 1996, 1998). The age of the last common ancestor of living primates thus determined corresponds to node 3 in Figure 1. It gives the minimum age for the presence of morphological characteristics considered to be shared-derived features (autapomorphies) of primates of modern aspect, assuming that all known fossil primates of modern aspect belong within the phylogenetic tree for extant primates. The present consensus view is that the earliest known primates of modern aspect (early Eocene adapiforms and omomyiforms) are sister groups of modern strepsirrhines and haplorhines, respectively. However, it is conceivable that the adapiforms and/or the omomyiforms diverged prior to the last common ancestor of modern primates. To allow for this possibility, we here extend our previously published analyses (Tavare et al., 2002) to estimate the time of the initial diversification of the primate clade (node 2 in Figure 1), which can be taken as the age of the first morphologically diagnosable primates of modern aspect. In our initial estimations of the time of divergence between living strepsirrhines and haplorhines, we considered only simulated trees in which an initial bifurcation led to living representatives on both sides. This implicitly incorporated the assumption that all known fossil primates of modern aspect are nested within the tree including all living primates. To allow for the possibilities that defining features of living primates might have emerged prior to their last common ancestor and that some fossil primates might have diverged prior to that ancestor, the analysis was repeated without the constraint of an initial bifurcation with surviving representatives on both sides of the tree. In order to estimate the age of node 3 in Figure 1, we start the speciation process from 2 initial species, both leading to living descendants. However, to estimate the age of node 2 in Figure 1, the speciation process starts from a single species. We are then assuming that this first species and all its descendants would be identifiable as primates of modern aspect by a paleontologist. It is important to recognize that the combination of features distinguishing primates from their mammalian relatives—and probably distinguishing the first primates from earlier ancestors in the lineage leading to them—are unlikely to have evolved simultaneously. As a result, designation of the first morphologically recognizable primates on a temporal scale can only be hypothetical, and the estimate of their age is an approximate indication of when the acquisition of primate characteristics took place. Repeating the model specifications that were used to estimate the age of the strepsirrhine-haplorhine divergence, the age of the first morphologically recognizable primates (node 2 in Figure 1) is estimated at 85.9 MYA, with a 95% confidence interval of (73.3, 95.7) MYA. 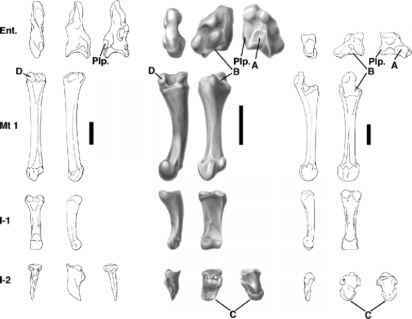 Note that the estimate for the strepsirrhine-haplorhine divergence is only 4.5 MY younger than the best estimate for age of the first morphologically recognizable primate. If the notion of a first morphologically recognizable primate provokes discomfort, it is reassuring to know that the relatively short time span between this construct and the last common ancestor of living primates allows one to use the age of the first morphologically recognizable primate as a proxy for the age of the last common ancestor of living primates. Therefore, for the most realistic model settings (i.e., assuming a logistic growth model with 90% of modern diversity reached by the base of the middle Eocene), our estimates of the emergence and subsequent diversification of primates of modern aspect are in broad agreement with molecular estimates of divergence times (Table 1). Other diversification models such as linear or exponential growth, as well as parametrization of the logistic growth with more recent dates, result in age estimates for the presence of the first morphologically recognizable primates that are even older. Paleontological estimates are derived from a statistical approach developed by Tavare et al. (2002). Estimated nodes refer to the nodes in Figure 1. Molecular estimates are from Arnason et al. (1996, 1998), Hedges et al. (1996), Janke et al. (1994), Kumar and Hedges (1998), Springer et al. (1997). that is applied. The results of the calculation are the same regardless of the number of modern primate species or estimated preservation rates and are as such based solely on the existing fossil record. As a consequence, their model is set to return the highest probability for the scenario in which the time of origin of a group is equal to the age of the oldest known fossil of that group. It, therefore, simply states that the more a scenario differs from a direct reading of the existing fossil record, the less likely it is to be real, thus entering precisely the kind of circularity which we have aimed to eliminate (Tavare et al., 2002). The problem with such an approach can be illustrated by applying the method of Gingerich and Uhen (1994) to the complete gap that exists in the primate fossil record during the middle Oligocene. That gap, between the Fayum primates of the early Oligocene and the earliest occurrence of platyrrhines in the fossil record of South America in the late Oligocene, is likely to cover around 6 MY. Application of the method of Gingerich and Uhen (1994) yields a vanishingly small probability of 2 x 10-19 that primates existed during that gap. In an analysis of evolutionary and preservational constraints on the times of divergence of eutherian mammals, Foote et al. (1999) concluded that molecular estimates of the times of origin of the living eutherian orders could be correct only if the preservation potential per lineage per million years was at least an order of magnitude smaller than it appeared to be. They consequently argued that it was unlikely for these ordinal divergences to have occurred as deep in the Cretaceous as the molecular clock data suggest. This conclusion, however, is not matched by our analyses of the fossil record of primates (Tavare et al., 2002). The reason for this discrepancy seems to lie in the estimated preservation potential of mammalian lineages. Foote et al. estimate the preservation potential for Cenozoic mammals to be between 0.25 and 0.37/lineage/MY (Foote, 1997, Foote et al., 1999), and that of Cretaceous mammals to be 0.03/lineage/MY. Significantly, the average values for the preservation potential based on our approach are 0.023/lineage/MY for the known fossil record of primates, and 0.003/lineage/MY for the time prior to the first known fossils. These values are, in fact, an order of magnitude smaller than those determined by Foote et al. (1999). It thus seems that our two very different methods of analyses of the fossil record are not in conflict; where we differ is in the estimated preservability of taxa.